Beef Stroganoff doesn’t get much easier than when you make it in your pressure cooker. Succulent, tender pieces of beef smothered in a flavorful mushroom sour cream sauce and served over noodles will satisfy anyone’s cravings! 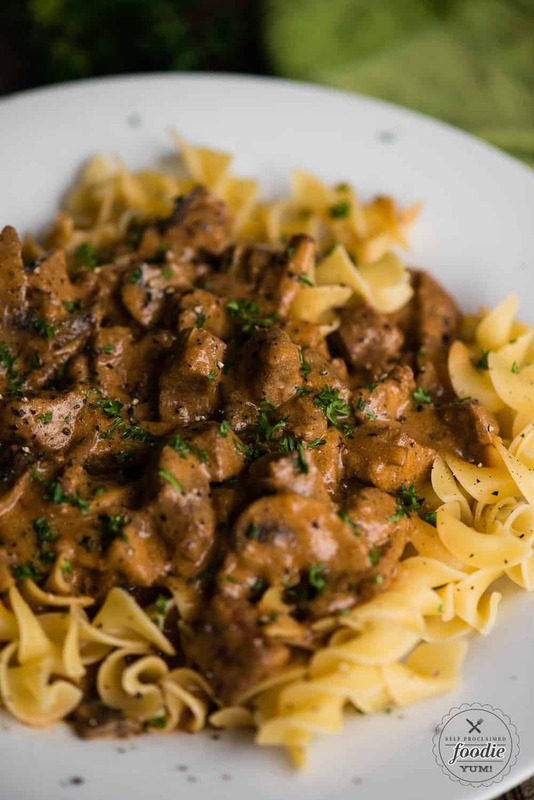 This classic beef stroganoff recipe is quick and easy when made in the Instant Pot! Beef Stroganoff is a favorite dinner in our house. Before I got my instant pot, I used to make beef stroganoff with ground beef. That recipe is still a keeper. But the genius of using a pressure cooker is that you can use inexpensive cuts of meat that have to be braised. The result is the most tender bites of meat that absorb all of the flavors. Having a food blog has it’s perks, and that includes getting to know other food bloggers and getting copies of their cook books! 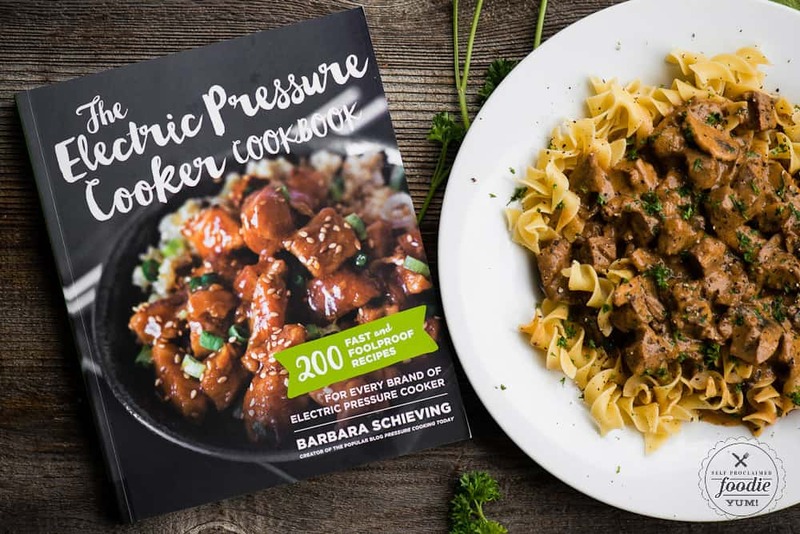 My friend Barbara has not one, but two blogs (Barbara Bakes and Pressure Cooking Today) and is a published author! 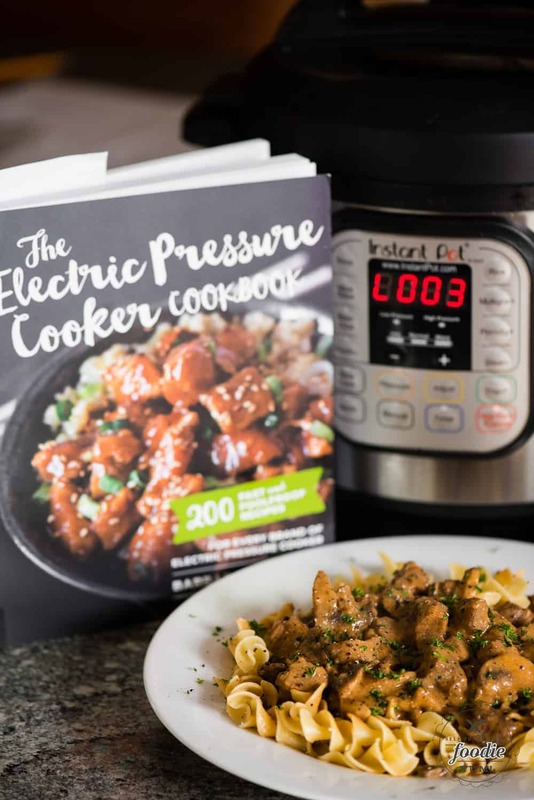 I highly recommend you order a copy of her book, The Electric Pressure Cooker Cookbook. I knew Barbara was an excellent baker because I got to enjoy her lemon glazed madeleines first hand. They were, for a lack of a better word, outstanding! I love finding new ways to use my pressure cooker using the recipes from her cookbook and blog. She is the most knowledgeable Instant Pot resource out there that I know of! Where did beef stroganoff originate? Did you know that beef stroganoff is a Russian dish? Traditionally, it is a meal that consists of sauteed pieces of beef served with a sour cream sauce. It’s origins are traced back to the mid-19th century but has become wildly popular around the world. The name came from Alexander Stroganov who was a Russian diplomat and minister of the interior. The original recipe had no onions and no mushrooms. In other words, no flavor. Over the years people’s taste buds must have evolved because most people know that any beef stroganoff recipe has both onions and mushrooms. Whether you choose to make beef stroganoff in the pressure cooker, on the stove, or in a slow cooker, one of the most important steps is to and brown the meat in oil. Barbara mentions the importance of this step in her recipe. It is important to sear the meat first because it adds an incredible depth of flavor, not to mention added texture. This is called a Maillard reaction. The flavor is not only infused into the meat, but all of those tasty bits get stuck to the bottom of your pan (or Instant Pot surface) and then into your sauce. The next step is to saute the mushrooms. I deviate slightly from Barbara’s recipe where she recommends cooking them in a separate pan. I went ahead and cooked them up in the Instant Pot where I browned the meat. If I can avoid washing a pan, I will. You then set those mushrooms aside because they don’t need to be pressure cooked. Next you’ll brown up some onions in the Instant pot. Then, the magic happens. You toss your browned meat back in the pressure cooker along with any juices that may have pooled on the plate. Add your beef broth along with a few other ingredients and you transform those tough cuts of meat into fork tender morsels. The final step is to thicken the broth into a gravy and then stir in the sour cream and mushrooms. Mercy. Barbara recommends using beef round steak. This is the cut I recommend for your easy beef stroganoff when using either your Instant Pot or crock-pot. I buy my cow from a local grass fed and finished farmer so I looked through my freezer to see what I had. I ended up using both Top Round London Broil and Eye of Round cuts of meat. Round steak is from the “round”, or rear leg, of the cow. You can find all sorts of round cuts including eye round, bottom round, and top round. These cuts may or may not come with a bone. Round steak is very lean. Cuts of meat like these must be braised, otherwise they will be incredibly dry and chewy. You know why a rib eye steak is so delicious? It’s because it’s marbled with fat. That’s why you can pan sear it or cook it up on the grill. Lean cuts of meat must be cooked low and slow in liquid in the oven, or quick and easy in liquid in the Instant Pot. If you wanted to cook your beef stroganoff on the stove top, I recommend using ground beef. Before considering what to serve with your beef stroganoff, you must consider what you want to smother with your beef stroganoff. I highly recommend egg noodles. 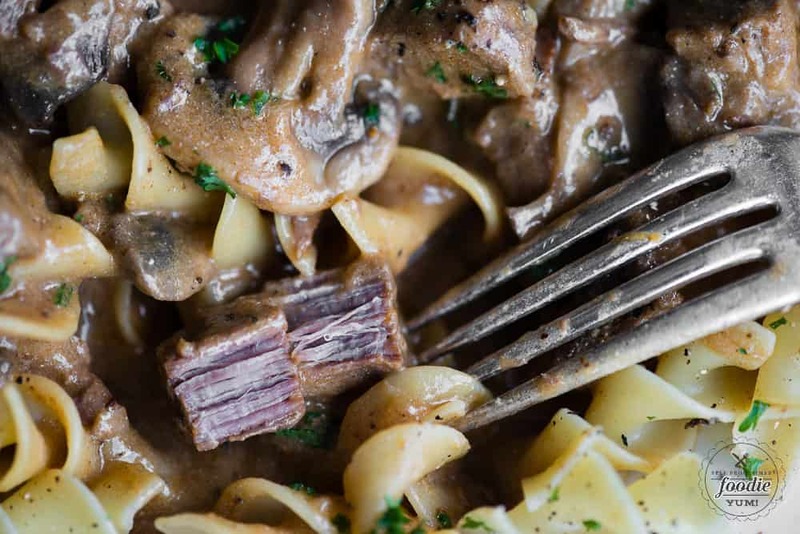 I suppose you could serve it over mashed potatoes, but for whatever reason this instant pot beef stroganoff recipe tastes best over al dente egg noodles, in my opinion. Although this recipe uses onions and mushrooms, I always love to serve a green vegetable at dinner. Some of my favorite choices to serve with classic beef stroganoff are wilted garlic spinach, sauteed garlic asparagus, or roasted broccolini. Can beef stroganoff be frozen and reheated? Absolutely. This is a great recipe to make in bulk, especially if you have multiple pressure cookers on hand like I do. You can make this recipe start to finish and then store the beef stroganoff in an air tight container (I recommend reusable quart sized cylinders). To reheat, be sure to thaw completely in the refrigerator (this may take several days) first. You can also run hot water on the outside of the container to loosen the frozen block. To reheat, just simmer on low in a covered pot. You want to keep it covered so that you don’t loose any of your moisture. Don’t freeze this with the pasta. This recipe will taste best over freshly made pasta. 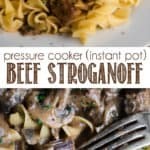 Beef Stroganoff doesn't get much easier than when you make it in your pressure cooker. Succulent, tender pieces of beef smothered in a flavorful mushroom sour cream sauce and served over noodles will satisfy anyone's cravings! 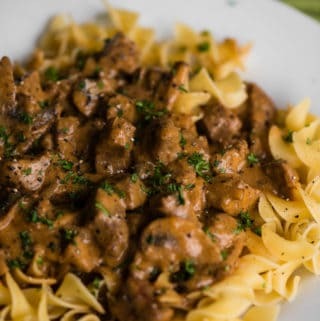 This classic beef stroganoff recipe is quick and easy when made in the Instant Pot! Season the beef generously with salt and pepper. Select Browning/Saute to preheat the pressure cooking pot. When hot, add 1 tablespoon oil. Brown the meat in batches, about 3 minutes per batch, until all of the meat is browned. Add more oil as needed. Do not crowd the pot. Transfer the browned meat to a plate. Add the remaining 1 tablespoon oil and butter to the cooking pot. When the butter melts, add the mushrooms. Cook for about 5 minutes until golden, stirring only to prevent burning and thus allowing the most browning. Transfer to a separate bowl and set aside. Add the onion to the cooking pot. Saute for about 3 minutes, stirring frequently, until soft and beginning to brown. Add the garlic and tomato paste. Saute for 1 minute. Stir in the beef broth to deglaze the pot, scraping up any brown bits from the bottom. Add the browned beef and accumulated juices. Lock the lid in place. Select High Pressure and 18 minutes cook time. In a small bowl, whisk the cornstarch and cold water until smooth. Add the slurry to the pot. Select Simmer/Saute and bring the gravy to a boil, stirring constantly until it thickens. Add the sour cream and the cooked mushrooms to the cooking pot and stir until blended. Serve over egg noodles. Much of the flavor in this dish comes from the browning stage - don't skip it! While it does take time to brown the beef, it adds a rich, caramelized flavor to the gravy that you just can't get any other way. So much great information. Looks delicious! Thanks so much for sharing! In your write-up you say that Barbara recommends lightly flouring the meat before browning but the recipe has nothing about this. Hi Laurie! My mistake! I just looked at her recipe again and I wrote the recipe down correctly – there is no flour. She does discuss the importance of browning, but not with flour. I added that little tidbit based on my own experience with browning meat for things like stew. I went ahead and removed the flour reference. Ugh. I need an editor! Delicious! I made this last night and the meat was nice and tender. I always hesitated making this with chunks of beef because I didn’t want it to be tough and usually make it with ground beef. I sprinkled the beef with salt, pepper, and flour before browning it. I loved that I was able to brown the meat in the Instant Pot before pressure cooking it. Thanks for the great recipe, it’s a keeper! Made this tonight, meat was tender and sauce was tasty! Love finding new ways to use my instantpot. Hi Lisa, I believe mine is a 6 quart. You can certainly scale this recipe up because it didn’t take up much room in the IP. Yep! I use my pressure cooker just like I would my slow cooker… it just takes so much more time and any time you have to brown the meat, you have to do that on the stove. I just made this tonight and it was delicious! I will definitely be making it again! Thank you! Can you cook the noodles in the same pot or do you need to make the noodles on the side? I was under the impression that I could put the noodles in the pot as well. For this particular recipe, I like to cook them separately so I can get them to the exact doneness that I like.